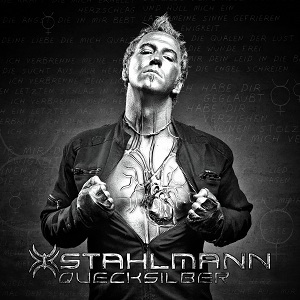 "Quecksilber" (Quicksilver/Mercury) is the second album from German band Stahlmann (Steel man). There is something that anyone listening to this album will think, so let's get straight to the point - there is a very strong resemblance to Rammstein. You've got a German band singing in German with a similar vocal style to Rammstein, with heavy industrial music that bears an amazing likeness to Rammstein's music. Having said that, you'd be missing out on a good album if you were to write them off as Rammstein clones and ignore them. Yes they do seem to be doing their best to imitate and emulate Rammstein, but they aren't the first band by any stretch of the imagination to be accused of being clones - "Kingdom Come" were famously known as "Kingdom Clone" in the '80s due to their heavily Led Zeppelin influenced music. If you can get over the fact that they are Rammstein clones then you'll find that this is actually a good album. There are some differences between Rammstein and Stahlmann - Stahlmann have the electronic element slightly more prominent, and are a fraction less heavy than Rammstein. For me if they'd gone for a different singer with a different style then they might stand out a bit more but with the current vocals they will remain labelled as Rammstein clones I'm afraid. I'm not going to go through and describe the various songs - there's a limit to what can be said without simply repeating "this sounds like Rammstein". Stahlmann are far too similar sounding to Rammstein to stand out, but if you're a fan of Rammstein and want to listen to something similar then this album is definitely worth a listen.